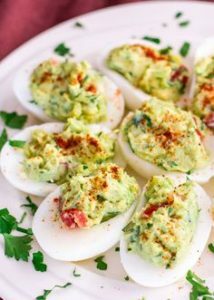 For me, no picnic is complete without deviled eggs. In order to make the best deviled eggs you gotta have hard cooked eggs. Notice I said hard cooked, not hard boiled. You don’t want to boil the eggs, you want to simmer them. To make perfect hard cooked eggy you want to place a single layer of room temperature eggs in a pan and then cover them with water, about 1 inch above the eggs. Cover the pot and bring the water to a boil, immediately reduce the heat to a simmer and cook for about for about 8 minutes. Immediately remove the eggs from the heat and then let them sit for 12 to15 minutes in the hot water. Rinse the eggs in cool water then tap the eggs slightly to crack the shell in a couple places. Return to cold water and allow them to cool. To peel your eggs after they have cooled tap each end of the egg lightly on kitchen counter to crackle the shell. Roll the egg between your hands or on your kitchen countertop to loosen the shell, then peel under gently running cold water. The final hard cooked egg tip is actually the one I’m asked most often, how do you get the yolk to stay in the center of the egg? It’s easy, just before you boil the eggs twirl it a couple times in a small bowl. This places the yoke in the center of the egg. I also like to recommend that you don’t cook more than 1 1/2 dozen eggs at a time. Cut eggs lengthwise in half. Remove the yolks and place them in a bowl. Mash the yolk and the mayonnaise, mustard, salt and pepper. Fill the whites with the egg yolk mixture, heaping it lightly. Cover and refrigerate up to 24 hours. 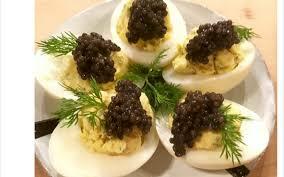 Right before serving, top each deviled egg with generous spoon of caviar. Garnish with minced chives Makes 12 eggs. This recipe can be doubled or tripled. Cut eggs lengthwise in half. Remove the yolks and place them in a bowl. Mash the yolk add the Parmesan cheese, horseradish, salt, dry mustard, pepper, and mayonnaise. Fill egg whites with yolk mixture and you want to have the mixture heaping. Garnish with paprika and add the olives to the top. Makes 12 eggs. This recipe can be doubled or tripled. Slice eggs in half lengthwise; remove yolks and set whites aside. In a small bowl, mash yolks with cheese, mayonnaise, salsa, onions, sour cream and salt. Stuff into egg whites. Refrigerate. Makes 16 servings. The avocado is a great change of pace and you won’t miss the yolks or the mayo in this recipe. Slivers of red, yellow or green bell pepper for garnish. Cut avocados in half. Remove pits, peel and cut into cubes. Place in medium-size bowl. Add lemon juice and garlic powder. Mash to blend. Stir in shallots and capers. Fill whites with avocado mixture. Garnish each egg with bell pepper sliver. Makes 2 dozen eggs.